THEODOR HERZL. Typed Letter Signed. Vienna, June 6, 1903. 1 p., in German. This urgent appeal to raise funds for the Sixth Zionist Congress was written following the horrific Easter Sunday massacre of Jews in Kishinev, Russia. It was at this Aug 1903 Congress that Herzl, in response to the pogroms in Russia, proposed that Zionists consider establishing a homeland in Uganda - a plan much decried and soon disavowed. Theodor Herzl. Hungarian-born Austrian considered the father of modern Zionism. As a journalist covering the Alfred Dreyfus affair in 1894, Herzl determined that the solution to anti-Semitism was the establishment of a Jewish national state. On October 15, 1894, Captain Alfred Dreyfus, the sole Jewish member of the French Army General Staff, was detained on charges of spying for Germany. Unfortunately, the Dreyfus trial was confidential and no one other than French military officers was allowed in the courtroom except for two days; the opening day, when the court announced the alleged charges, and the final day when the jury made its decision. After attending both sessions, Herzl became convinced of Dreyfus’s innocence. Puzzled by the trial, he researched Dreyfus, trying to decipher a motive the captain would have to spy for Germany. Herzl deduced that the sole reason for the accusation against Dreyfus was that he was a Jew; this conclusion contributed to his belief that anti-Semitism was unavoidable. Herzl firmly believed that the only solution was for Jews to immigrate to their own land. In 1896, Herzl published Der Judenstaadt which argued that the Jewish problem was essentially a political one that required a political solution – the establishment of a Jewish State. 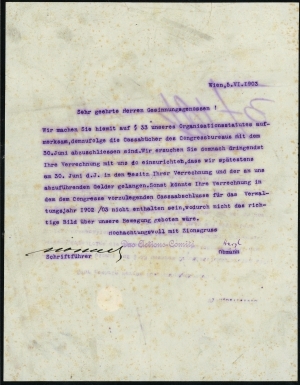 One year later, he convened the First Zionist Congress in Basel, Switzerland, where he boldly declared that “Zionism seeks to establish a home for the Jewish people in Palestine secured under public law.” His efforts came to fruition only 50 years later, when David Ben-Gurion read Israel’s Proclamation of Independence in Tel Aviv, beneath a picture of Theodor Herzl.